URFC relies heavily on long-term planning to manage our 49,767 acre Usal Redwood Forest in an environmentally responsible, socially acceptable, and economically viable fashion. Our Forest Management Plan, first published in March 2015, took more than ten years in development. 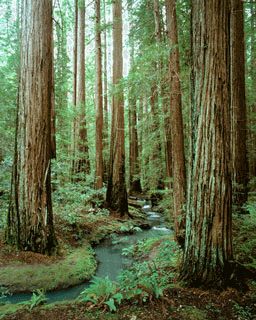 It is a comprehensive statement of Redwood Forest Foundation Inc.’s policies and practices for managing the Usal Forest and is intended as a guiding document for the Usal Redwood Forest Company’s forest management professionals. This Forest Management Plan is a living document that is reviewed annually and revised as new information and community input become available. The current forest condition (Charts 1-3) determines how the Usal Redwood Forest will be harvested (Chart 4). 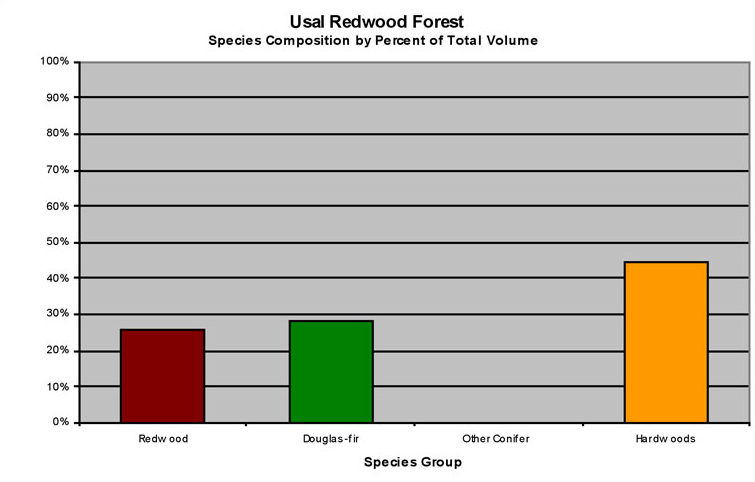 Two important aspects of the Usal Redwood Forest can be seen from the graphs. First, the forest is young, and second, it is dominated by hardwoods. In order to address the social and environmental aspects of community forestry, the RFFI Board has instructed the URFC to not use forest herbicides to manage competing vegetation for the three year period between 2013 and 2016. Instead the URFC uses more costly, time-consuming non-chemical techniques, i.e., manual cutting, mastication, etc. Over the course of the three year moratorium, RFFI will evaluate the costs and effectiveness of these methods of arresting competing vegetation. Evaluation criteria will most likely include worker safety issues, costs, and seedling response (growth). The Usal Redwood Forest, owned and managed by the Redwood Forest Foundation, Inc. (RFFI) and its subsidiary, the Usal Redwood Forest Company (URFC), was awarded certification from the Forest Stewardship Council® (FSC®) as a “well managed forest” in 2015. FSC certification assures that RFFI’s management of the Usal Forest conforms to an International and National set of standards assuring sustainable forest management. These standards establish expected levels of performance addressing social, economic and environmental parameters recognizing the context of how forests support and nurture local communities and industries. The certifying body, Scientific Certification Systems (SCS) is a California-based organization who has been a founding member of the FSC movement. Their Vice President of Forest Management Programs is a UC-Berkeley trained forester and an international leader in the certification movement. RRFI’s long-term goal for the Usal Redwood Forest is to attain a forest dominated by merchantable redwoods and Douglas-fir trees. The forest is now dominated by under-sized conifers and hardwoods, the legacy of past forest extraction programs. FSC certification ensures third-party oversight of the decisions and actions of the RFFI Board, over time, to insure that the standards of sustainable forest management are not violated. This collaborative effort between RFFI and FSC establishes a business relationship with both parties working together for the same desired goals. As with all forest management programs this is just another component of a large and complex process with the intended outcome of assuring an ecologically functional, economically viable, and socially acceptable forest management operation. FSC Principles and Criteria provide a foundation for all forest management standards globally, including the FSC US National Standard (v1.0) that guides forest management certification in the U.S. FSC certification ensures that products come from responsibly managed forests that provide environmental, social and economic benefits. The FSC Principles and Criteria provide a foundation for all forest management standards globally, including the FSC US National Standard (v1.0) that guides forest management certification in the U.S. 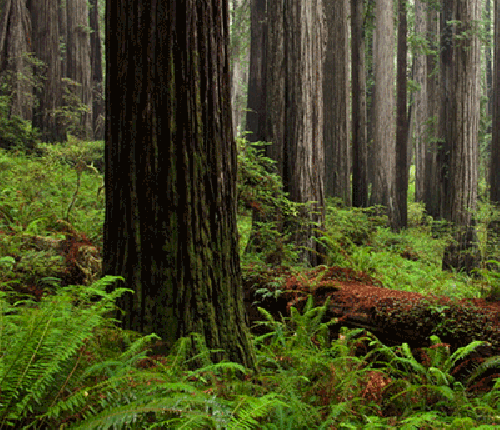 In 2011, the Redwood Forest Foundation (RFFI) closed a landmark conservation transaction on their 49,576-acre Usal Redwood Forest. 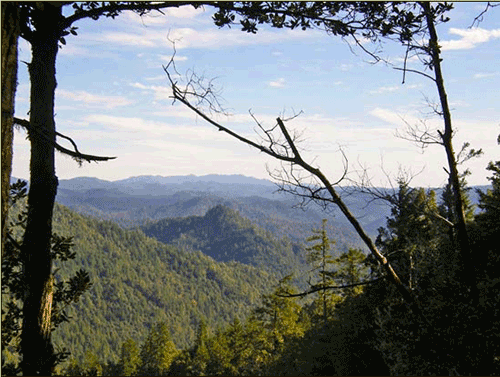 The Foundation sold a conservation easement on the Usal Redwood Forest to the non-profit Conservation Fund. This ambitious and complex transaction allows RFFI and our conservation partners to protect one of the largest non-profit owned ‘working forests’ in America – a forest landscape that covers a land area almost twice the size of the city of San Francisco. The transaction was completed with the support of a strong coalition of national and local elected officials, conservation organizations, private foundations, industry leaders and committed regional residents. RFFI is engaged in a complex, multi-faceted effort to certify the carbon that is and will be sequestered through implementation of its conservation strategy. After four years of diligent work with our advisor, US Forest Capital, RFFI has successfully registered 3,166,372 tons of Usal Redwood Forest carbon with California’s Climate Action Reserve (CAR). 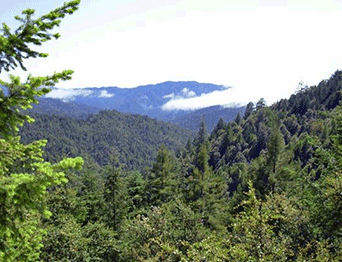 The Usal Redwood Forest carbon project is one of the largest forest carbon sequestration projects in the country. CAR registration is a significant step towards registering the Usal Forest’s carbon project with the California Air Resources Board (ARB). As part of CAR’s early action program, an independent third-party verified the carbon sequestered by Usal’s sustainable forest management practices. The second step, i.e., independent verification of carbon measurements by a third-party verifier, was completed in May 2016. This moves the project forward for review and final registration by California’s Air Resources Board. It is anticipated that the Usal Forest carbon project will be approved by the ARB by late 2016. With ARB approval, Usal’s carbon credits will be registered as “compliance” credits that can be sold to companies that are required to offset carbon emissions by California’s landmark climate change policies. 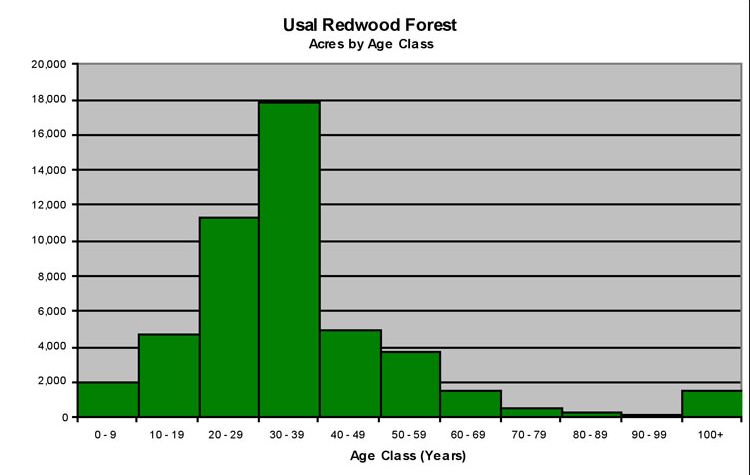 Forest Age: Chart 1 shows the number of acres of each age class in the Usal Redwood Forest. This chart indicates that the Usal Redwood Forest is young, with about 18,000 acres in the 30 to 39 year old range. Mature harvest age is generally about 50 to 60 years old. Therefore as young trees mature to harvest age the volume of timber taken off the land will increase. This is reflected in Chart 4 (Base Conservation Harvest Scenario). For the first ten years of RFFI ownership harvest levels in the Usal Redwood Forest under the base conservation scenario are minimal. Bank of America does not require RFFI to start making loan payments for ten years, making the initial low harvest levels economically feasible. Chart 2 shows that the Usal Redwood Forest is currently dominated by hardwoods. Past over-logging allowed rapidly growing hardwoods to shade out young redwood and douglas fir, prohibiting their growth and upsetting the natural balance of tree species in the forest. Currently hardwoods account for over 40% of the volume in the Usal Redwood Forest (Chart 2). Herbicide application and variable retention harvest are two ways of reducing the volume of hardwoods in the forest giving young redwood and fir a chance to grow. Once the natural balance of tree species is achieved, selective cutting and sustainable forest management will assure that this balance is maintained without further use of herbicides or variable retention harvesting. 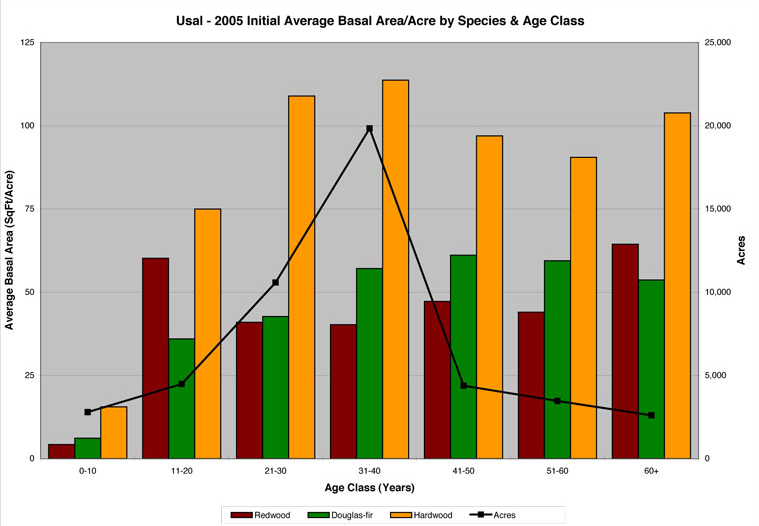 Chart 3 combines information provided in charts 1-2 to show the current average area per acre of redwood, douglas fir, and hardwood for each age class in the forest. The black line shows the total number of acres of each age class currently in the Usal Redwood Forest. 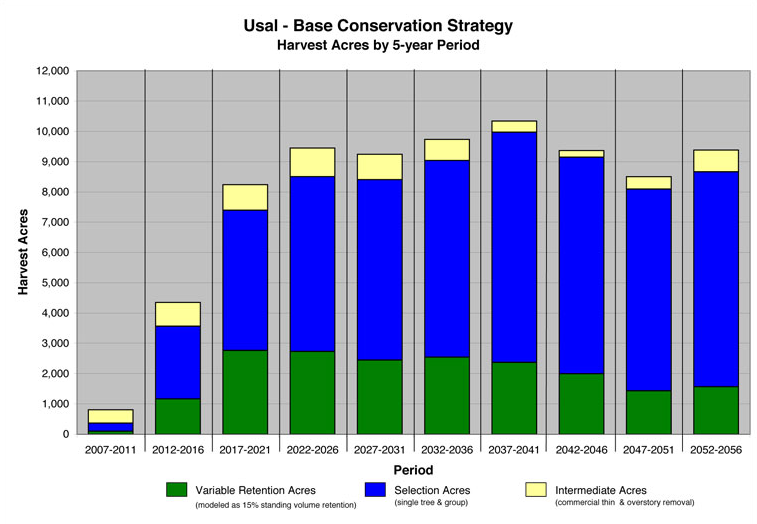 The base conservation harvest scenario in Chart 4 is based on the current condition of the Usal Redwood Forest that is described by Chart 3. The young age of the forest and the dominance of hardwoods necessitate the initial low harvest levels and variable retention harvesting that is written into the base conservation scenario. It is important to point out that Chart 4 is a visual representation of the base conservation scenario, a scenario that RFFI created to define minimum conservation attributes associated with their property management. The sale of a conservation easement and resulting debt reduction will allow RFFI to stay within this set of management guidelines. RRFI’s long-term goal for the Usal Redwood Forest is to attain a forest dominated by merchantable redwoods and Douglas-fir trees. The forest is now dominated by under-sized conifers and hardwoods, the legacy of past forest extraction programs. FSC certification ensures third-party oversight of the decisions and actions of the RFFI Board, over time, to insure that the standards of sustainable forest management are not violated. This collaborative effort between RFFI and SCS establishes a business relationship with both parties working together for the same desired goals. As with all forest management programs this is just another component of a large and complex process with the intended outcome of assuring an ecologically functional, economically viable, and socially acceptable forest management operation. RFFI will continue to own and manage the Usal Forest for the economic and ecological benefit of the region. This easement sets standards in place that protect the forest in perpetuity, regardless of its ownership. The easement establishes a fundamental conservation scenario that prohibits fragmentation and development. annual monitoring be conducted by the easement holder. This momentous transaction assures that Usal Redwood Forest will remain intact, in perpetuity, as a working community forest for the economic and environmental benefit of the fish, wildlife and humans that reside there. It also holds promise for regional and global impact due to the climate change implications of large landscape conservation, economic impact and replicability of the model.